This is a feature that people always seem to benefit from once they find out about it. I've been using it since it has been available and it has been amazing. If there are any responses that you continually re-write over and over again, Gmail's "Canned Responses" feature is there to help. For instance, when I get general inquiries of my rates, I have a perfectly written general response that gets used before getting deeper into the discussion. Once I write it the first time, I simply go into the canned responses section and save it. You can name it as whatever you want. They also act like lego blocks in that you can stack responses. So if you have a paragraph for rates, and one for availability, you can input them both wherever you want. Let's say I have to travel for a job in a few weeks and I want potential clients to know as it may clash with the deadline, I will have that as a canned response so that any new clients that message me in the coming weeks know as well. If you don't have it enabled, here's how to get it! 1) Go into your settings once you are in your e-mail. 2) Go to "Labs" where you can enable additional features (It's amazing!). 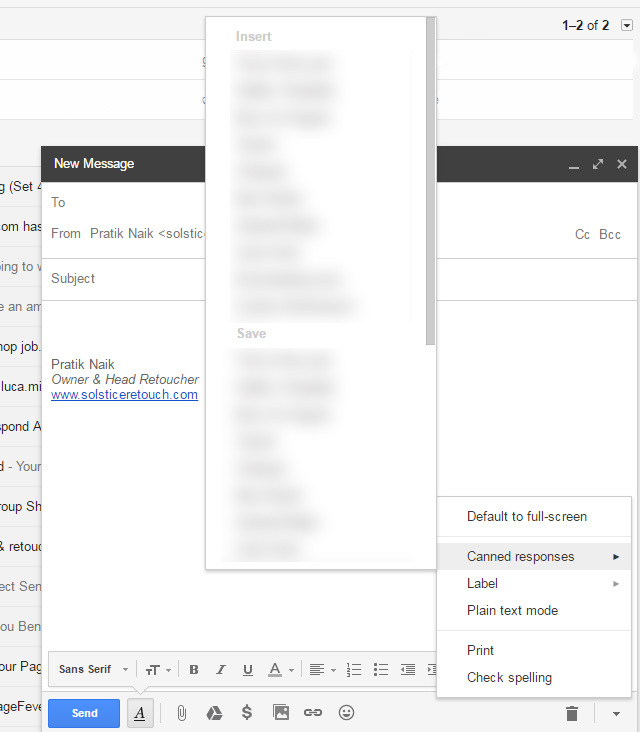 4) Go through and enable any other feature you like, there are some good ones like "undo send" - I use that daily.